I've just experienced posterior vitreous detachment. I am a massage therapist. Should I refrain from work for a few weeks to avoid complications as my work is very physical? Also, can recent headaches be connected to this detachment? Dear Mona, thank you for your questions. Posterior vitreous detachment is very common and most people do not develop any problems from it due to physical work. It also shouldn't cause headaches. However, if the posterior vitreous detachment is associated with a retinal tear, then the retinal tear needs to be treated to prevent a retinal detachment from occurring. The 3 main symptoms of retinal detachment are: floaters, flashing lights, and shadow or curtain effect in your field of vision. If any of these develop, regardless of whether you are physically working or not, you should consult with an ophthalmologist to get your retina examined. How close together and how frequently can you have intravitreal injections? Dear Cris, thank you for your question. The answer depends on the reason you are having intravitreal injections. If it is for infective endophthalmitis after surgery, then you may require intravitreal injections of antibiotics within 48 hours of each other. If performed as treatment for macular degeneration or treatment for diabetic retinopathy, then intravitreal injections are usually given every 1 to 3 months, depending on the clinical response to the injections. My eyes have been watering constantly for the past two weeks. I have been to the doctor, only to get treatment for allergies and the drops or tablets are not working. My eyes water all day long and even while I sleep. Please help. Dear Kelly, thank you for your question. Watery eyes are due to increased tear production due to irritation or reduced drainage of tears due to blocked tear ducts. To me, it sounds like your eyes are watering as a result of irritation from either a viral infection or allergic reaction or blepharitis. My suggestion would be to consult with an eye specialist to have your eyes examined and treated appropriately. Goodday, I run a patient group for Rare Diseases in South Africa. I was recently contacted by a patient who is 85, and has giant cell arteritis. According to the opthamologists she has seen, the problem is not her eyes but the nerves behind the eyes which have received too little oxygen in the blood due to the temporal arteritis. I believe that some stem cell experiments have helped other causes of blindness and the patient is prepared to be experimented on with stem cells or anything else which could regenerate the optic nerves. Could you give us any info on this type of treatment or refer us somewhere where they could? Dear Kelly, thank you for your question. Giant cell arteritis is a disease where arteries become inflamed, to the extent where blood is unable to flow through the affected artery. When the artery to the optic nerve becomes occluded from giant cell arteritis, the optic nerve 'dies' because it is unable to receive oxygen and nutrients due to the lack of blood. So although the eye itself remains healthy, there is no vision from that eye due to infarction of the optic nerve. There is currently no established treatment for optic nerves that have been damaged this way. As far as I know, there are currently no large scale human clinical trials on stem cell therapies for optic nerve degeneration (although there have been studies on animal optic nerves). Having said that, the Dr Himanshu Bansal Foundation has had some success with stem cell therapy for optic nerve dysfunction, so you may wish to contact them for advice. Hi, I like your website and I truly believe that apart from the practice of medicine, we must give the right information to people and be open to hearing their views too. Great work. 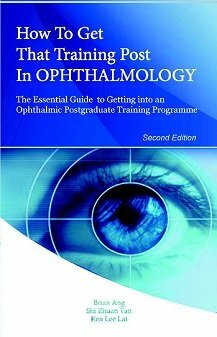 I am a practising ophthalmologist in Nigeria. Dear Olukayode, thank you very much for your kind comments. It is my sincerest wish that as many people as possible can benefit from the educational content of my website. Any feedback is always appreciated. Hi, I'm from North Wales in the United Kingdom, I'm registered as partially sighted with my hospital since 1997. I cannot drive at all. I suffer from these eye conditions: nystagmus, photophobia, astigmatism, and ocular albinism. My visual acuity is 6/36. I wish to be registered as severely sight impaired - is this possible with above eye problems? My optician now makes me read the Snellen chart right close to me and I can only read 1 letter on the chart. Is it worth my optician referring me to see an eye specialist? Please reply, thanks. P.S. I now get headaches all the time associated with blurry vision. I can't sit on the PC for more than 5 minutes before my eyes hurt and tickle. Dear Elfed, thank you for your question. Unfortunately, your visual acuity is not at the level where you are eligible for blind registration. Having said that, I believe that it is worthwhile for your optician to refer you to see an eye specialist or ophthalmologist as he or she may be able to help you in other ways. Hi, I had my retinal detachment surgery 3 days ago. My eye was injected with gas, but all I can see through my eye is a light and a little shadows if I get closer to the object. I called the nurses in the hospital and explained to them my problem, and they said it is normal and I'll be like that for at least 3 weeks. Please doctor tell me if that is normal. Thanks. Dear Youssef, thank you for your question. What you have described is typical following retinal detachment surgery (vitrectomy with gas). The gas can take up to 6 weeks to dissolve, and so your vision may remain blurred during that period of time. Good luck! We need advice about this case, the patient is living in Egypt and we need information about the the best operation that can be done to improve the physiological function of that eye. Dear Yassein, thank you for your question. The only way to treat retinal detachment with subretinal fibrosis is with retinal detachment surgery (vitrectomy with silicone oil). The earlier the surgery is performed, the better the chances of a good outcome. Good luck! I have an aunt who suffers from glaucoma in both eyes (pressure is 25 and 35 respectively). She went to an ophthalmologist and was advised to undergo a crystalline lens (cataract) surgery to correct for the high pressure in the eyes. He explained to her that the crystalline lens becomes bigger, the high eye pressure does not respond to the eye drops any longer and replacing it would resolve the problem (i.e. the eye would respond better to the eye drops). She has already undergone one glaucoma laser procedure in both eyes and the holes made by the laser during that surgery are not closed yet. From what I read on your website, one of the side effects of a cataract surgery is elevated eye pressure, even more so for the glaucoma sufferers. Would you advice her to cancel her cataract operation? She does not suffer from cataract. Many thanks in advance for your help. Dear Daniela, thank you for your question. I absolutely agree with your ophthalmologist. With age, the lens grows bigger and this can cause physical obstruction of the drainage angle. The intraocular pressure can become elevated as a consequence. Removing the lens can therefore both improve vision and lower the intraocular pressure. Having had the cataract removed also makes it easier to perform glaucoma surgery if required in the future. You are right in that one of the complications of cataract surgery is elevated intraocular pressure. This is not usually long-lived and can be controlled with medication, and if necessary, surgery. Although this risk can be a real problem for some patients, I think on balance the potential benefits outweigh the risks. Hello, I have a question. I had a retinal detachment and surgery in May of 2012. It's been about 8 months since the surgery. I had three post lasers for small holes but they're ok now. The retina is holding up pretty well now. My question is if I will be able to snowboard now because the season has started. Would it be ok if I went and took it nice and easy or will I not be able to snowboard again? I also want to try Insanity or p90x workout programs so my question is: what kind of workouts I can do and how much I can lift? It involves a lot of cardio which includes push ups, sit ups and jumping jacks, etc. Dear Devin, thank you for your question. It sounds like you had a good result following surgery and laser for your retinal detachment. From what you describe, I cannot see any obvious reason why you cannot snowboard nice and easy. In terms of workout programs, that's a bit more tricky because it partly depends on what operation was done for the retinal detachment and partly on whether there's going to be lots of sudden jerky movements involving the head. Ideally, you should ask your ophthalmologist, as he or she will have greater understanding of how your eye is recovering.